In 2015-16, The Bok Center launched the Learning Lab, a space designed to house and incubate faculty-driven projects related to teaching and learning. The Learning Lab fosters, elevates, and amplifies the teaching and learning experiments and explorations of Harvard’s faculty – helping them to build, test, deliver, and disseminate learning objects and activities, new courses and new assignments. To our faculty partners we offer resources, space and an intergenerational community of collaborators: artists and technologists, postdocs and graduate students, and—crucially—Harvard College undergraduates who serve as both testers and partners in creating the future of teaching and learning. Many of the innovations we see in the classroom involve not merely new modes of delivering information from faculty to students but also new modes of student activity: new ways to collaborate and build, new media within which to express ideas, new assignments that offer students alternatives to papers and exams. The Learning Lab draws on the skills of the Bok Center’s Media, Literacy and Visualization team to help faculty, graduate students and undergraduates develop fluency in the new and old media they will use to generate and share their ideas: filmmaking, web design, 3D modeling, data visualization and game design, as well as speech, performance, the written word, improvisation, and the use of physical space. Some of the 2015-16 Learning Lab projects are described below. Professor Elena Kramer collaborated with the Learning Lab to craft a creative assignment that maximized student understanding of the rise of the sporophyte in the evolutionary history of plants. In conjunction with the Bok Center, Professor Kramer and MLV Fellow Morgan Furze re-wrote a previous assignment to articulate the learning goals of the assignment and clarify the rationale for the creative nature of the project. They also added two additional elements: Morgan hosted several “hackathons” for students, especially those using video equipment, to aid with technical problems that might arise as students experimented with producing academic work in unfamiliar mediums, and, at the end of the project, students were required to come to the Bok Center to record their “artist statements.” In these statements, students were asked to state why they chose the medium that they did, and the rationale behind their major artistic choices. Professor Kramer noted that projects were of higher quality and more careful consideration than in years past, while students took greater ownership over course material by intentionally translating the content into the medium of their choice. Professor Missy Holbrook, in collaboration with MLV Fellow Morgan Furze, produced a series of short videos for OEB 52 that explained a concept with which students had consistently struggled in past iterations of the course. The videos taught the concept in concise units and were assigned to be watched for homework in the style of a “flipped classroom,” freeing up class time for Professor Holbrook, alongside her teaching staff, to lead the class in interactive activities designed to enhance students’ comprehension of the material. The Learning Lab assisted Professor David Cox as he designed and implemented a mixed-media paper-talk assignment, a multi-part project intended to develop students’ skills in visual explanation both as individual presenters as well as members of a team. The first portion of the assignment asked students to choose a figure from one of two scientific papers and to storyboard a series of drawings that explain the figure’s importance to the study’s methods, findings, and overall thesis as well as the historical context of that particular research area. The assignment culminated in a spoken presentation that explained the storyboard. The second portion of the project took the place of the midterm for the course and required students to apply those same skills to a group, rather than individual, report. In considering the most precise visual articulation of the course content, students developed a deeper, more engaged understanding of the material. Professor Jie Li collaborated with the Learning Lab to modify a series of assignments to include a “video essay” as a possible medium in which students could submit weekly responses to the course material. Each weekly prompt included a film-specific assignment, and as part of the course renovation Professor Li and MLV Fellow Stephanie Lam provided students with extensive resources related to film production – practical “how-to” guides that provided technical guidance on iMovie and Final Cut, tip sheets, examples of model assignments, contextualizing readings, etc. – to ensure that even those with no experience in film had the tools necessary to select the “video essay” option. Professor Li also organized a workshop to train course Teaching Fellows in how to evaluate and provide feedback on film-based assignments. The combination of these tools aided in the course’s successful scaling up from a mid-size lecture of 45 students to a large open-enrollment course offered as part of the General Education program. Perhaps most importantly, however, the addition of the video essay created a middle ground between the critical and the creative in which the students could express their analytical ideas by means of the medium relevant to the class: film. Professor Irwin Shapiro, in collaboration with MLV Fellow Anya Yermokova, introduced two movement-based “labs” into SPU 22, and also added the option to produce a creative final project in lieu of a critical paper. In the first movement lab, students participated in a simulation that produced the movement described in Kepler’s law; the second movement lab taught the complicated thermodynamics behind protein folding by means of a series of improvisational movement experiments. In combination with the traditional modes of relating physical processes – text and image – the exercises provided students with an alternative and illuminating perspective on the course material. In the spirit of these movement labs, students were also allowed the choice to produce a creative final project. Those who chose this option later recorded “artist statements” explaining their decision-making process at the Bok Center, and all students, regardless of the medium of their final project, were issued a final oral exam at the Bok Center, where they were asked to explain and draw key concepts from the course beneath the overhead camera in the Bok Media Lab. Professor Elisa New’s “Poetry in the Digital Environment,” co-offered by GSAS and HGSE, was an innovative course offered during the Spring 2016 semester that taught future teachers – be they headed for Higher Education or the K-12 space – how to cope with the digital and hybrid classrooms that they will encounter. The course met each week at the Bok Center to practice a new mode of digital or brick-and-mortar teaching, and each participant worked with the Learning Lab to produce their final projects, which developed in three distinct phases. 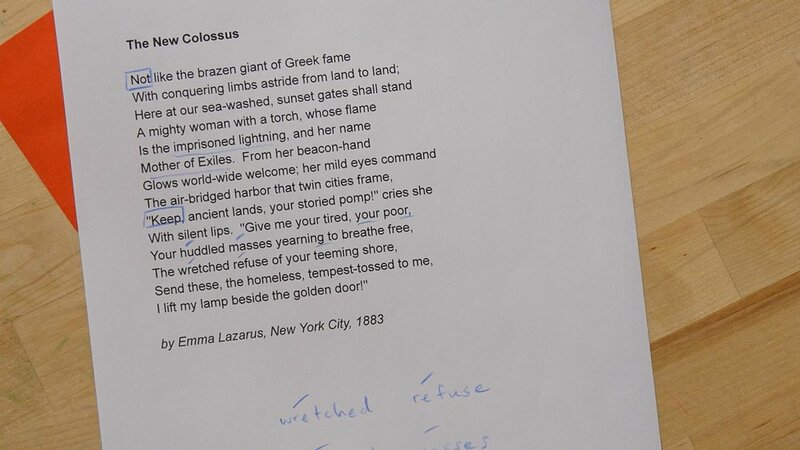 Early in the semester, students filmed a close reading of a single poem. In the second phase of the project, groups of students engaged in a long, freeform discussion of a poem of their choice. Students then edited the film of these conversations into a coherent narrative and compiled a course packet intended for other teachers who, with these combined materials, could present a week’s worth of material, including pre-learning exercises, journaling, in-class discussion and assessment, on each of the two selected poems. The course demonstrated an effective model of incorporating simple media processes, such as filming individual or group discussions, into the learning environment. During the Spring 2016 semester, Professor Peter der Manuelian partnered with the Bok Center to develop a 3D modeling and virtual curation assignment for his “Pyramid Schemes” egyptology course. The Bok Center collaborated with the Peabody and Semitic museums to produce 30 3D scans and models of Egyptian artifacts, then offered a training session for all students who pursued this assignment option to provide them with the skills necessary to design a 3D museum exhibit. Faced with the task of curation within the confines of a museum space, students put into practice what they had learned about both Egypt and museum design over the course of the term. At the end of the term, students were able to tour all of their peer’s virtual exhibits at the Bok Center’s pop-up virtual reality stations. During the Spring 2016 semester, Professor Emily Dolan co-led a graduate seminar with her colleague Jonathan Stern, Professor of Culture and Technology at McGill University in Montreal. For this course, Bok Center helped develop a model for conducting a humanities seminar concurrently in two locations by video conference. The seminar settled on a model in which each professor facilitated live discussion among students via video chat, supplemented by a live text backchannel (via Google Docs), on which students shared ideas, references, and links. At the end of the semester, the Bok Center conducted interviews with graduate students from Harvard and McGill, collecting their reactions and experiences, in addition to their reflections on the seminar's emergent meta-theme: in a class on instruments and instrumentality, the classroom itself was revealed as an instrument of teaching and learning. During the Spring 2016 semester, Professor Ed Glaeser recorded a series of 40 short video pieces, each approximately 7-15 minutes, for his Intermediate Microeconomics course, Ec 1011b. The videos were designed to give students “just-in-time” access to the basic principles of Calculus required in order to perform certain microeconomic modeling operations in Professor Glaeser’s course. To create the videos, the Learning Lab collaborated with Glaeser to develop effective strategies for teaching calculus online. The Bok Center collaborated with Professor Alex Rehding to develop a novel assignment for The Art of Listening, one of three "frameworks" courses in the humanities. The Bok Center devised a workflow using Google Maps and YouTube that allows students to create a persistent sound map of Cambridge, which will continue to grow with each year's offering of the class. Looking forward, Rehding will continue to collaborate with the Bok Center in order to create a more customized, flexible, and sound-specific solution. In Professor Sasha Kimmel’s Spring 2016 psychology course, students undertook interviews of subjects whose political views are diametrically opposed to their own. The Bok Center provided workshops for the students on storytelling principles and on the technical skills for creating a podcast. Later, in a podcast in the style of “This American Life,” students reflected on what the interview process taught them about the psychology behind political identity in America.